More surprising than the content of a pro-Trump opinion column by a former administration official was the byline on it. 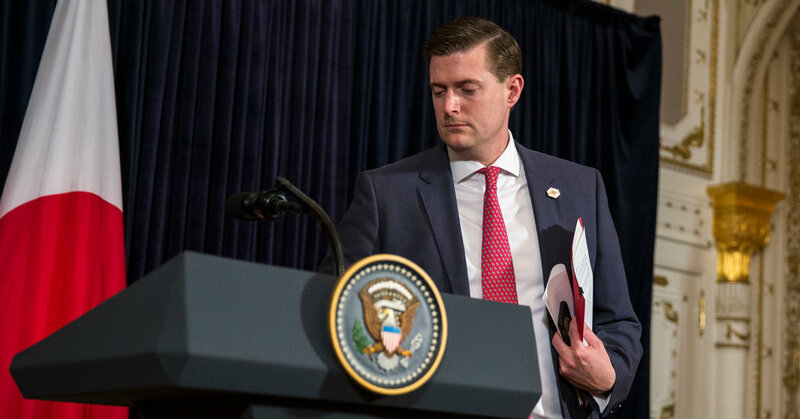 The piece was written by Rob Porter, who resigned as the White House staff secretary in February 2018 amid domestic abuse accusations from both of his former wives. The Journal did not mention the circumstances that led to Mr. Porter’s departure. Mr. Porter, who still lives in Washington and had been one of Mr. Trump’s most influential aides, has stayed out of the public eye since his resignation. Some saw his op-ed article as a first step toward re-entering the public arena after a year in the shadows. But a response published on Thursday in The Washington Post by one of Mr. Porter’s former wives was the latest reminder that in the era of the #MeToo movement, a quiet comeback is complicated and a simple timeout, for many, is not viewed as enough. In a blog post describing her marriage in which she did not identify Mr. Porter by name, Ms. Willoughby accused him of pulling her, “naked and dripping,” from the shower to yell at her and said that she had filed a protective order with the police after he punched in the glass on the front door of her house while she was locked inside. She has also detailed other emotional and verbal abuse. Mr. Porter’s other former wife, Colbie Holderness, has described their relationship as “verbally, emotionally and physically abusive.” She has shared with the press photographs of herself with a black eye and a swollen cheekbone, which Mr. Porter said at the time were misleading. He has denied all allegations of abuse in the past, and did not return calls or respond to text messages on Thursday. The power of Ms. Willoughby’s response to Mr. Porter’s re-emergence might be in its measured manner, in which she weighs how one should be allowed to return to public service after a scandal involving abuse. Mr. Porter, she wrote, should not be “forever barred from using his considerable professional skills and knowledge to make a contribution to our society.” She added that she had no agenda for Mr. Porter’s future and outlined ways that fallen men might succeed in rehabilitating themselves. The Journal declined to comment on its decision to publish Mr. Porter’s piece. Mr. Porter has never publicly addressed the allegations against him. His only public statement since his departure last year was a written rebuttal to the journalist Bob Woodward’s book “Fear: Trump in the White House,” which portrayed the White House as a building in deep disarray and Mr. Porter as a guardrail on an unstable presidency. Many White House officials have remained friendly with Mr. Porter, and Mr. Trump has expressed frustration over the coverage of Mr. Porter’s departure, which he said did not provide his former aide with a chance to defend himself. Mr. Porter, a Rhodes scholar who served as chief of staff to Senator Orrin G. Hatch, Republican of Utah, was seen as a rising star in Republican politics. But he is not the first man who left a prominent perch after an abuse or harassment scandal and then found the road back difficult. Louis C.K., the comedian who admitted to sexual misconduct in 2017, tried to quietly trot out his stand-up routines at comedy clubs in New York City after a 10-month hiatus. But his re-emergence was criticized by many other comedians. And Mario Batali, the celebrity chef who admitted to “inappropriate behavior,” was criticized for “actively exploring” a comeback after ABC pulled him from one of its weekday talk shows.